I found this recent NY Times article twisted even by the standards of the Times. Entitled "When Parents Scream Against Ice Cream", it details the efforts of parents in a number of cities to ban summertime ice cream vendors from parks or even entire neighborhoods. The basic premises are that ice cream is a sugary treat that is bad for kids and that ice cream vendors are "dirty" and "dangerous". But the real bottom line is that all too many parents just don't want to say no to their children when they're asked to buy treats. Ice cream is an innocent sweet delight, one of life's simple pleasures and here come the scolds to try to take it away. I was going to turn this into a short essay on weenie parents afraid to tell their children no, but figured I would just sound old and cranky. So I have decided to take the more positive path of ice cream proliferation. We make a lot of ice cream at our house using this new style machine that I got for Father's Day a few years ago. It's easy and works great with no ice or rock salt mess. In the warm months I'd say we average a batch a week. I'm putting in this recipe for dead simple no-cook vanilla ice cream that came with the manual (thank you, Cuisinart!). It's so simple even I haven't been able to screw it up yet. In a medium mixing bowl, use a hand mixer on low speed to combine the milk and granulated sugar until the sugar is dissolved, about 1 to 2 minutes.Stir in the heavy cream and vanilla. Turn the machine on; pour the mixture into freezer bowl, and let mix until thickened, about 20 to 25 minutes. The ice cream will have a soft, creamy texture. If a firmer consistency is desired, transfer the ice cream to an airtight container and place in freezer for about 2 hours. Remove from freezer about 15 minutes before serving. We've used half buttermilk/half whole milk for a richer taste. Go make some and give it to your kids! Give it to your neighbors' kids! Take that, ice cream haters! Great! We use the old hand-crank kind (of course!) but agree completely in the Power of Ice Cream and its enduring place in the hearts of Real Americans! I just ordered a nifty one that's inside a ball you roll around. I'm going to make my poor, abused dogs do the work for me. If they do it well, I'll share the fruits of their labor. I about abandoned this blog just from that title! Glad to see it should really read, "The Horror of Ice Cream HATERS!" Don't mess with my ice cream. Homemade is the best! I highly recommend David Lebovitz's "The Perfect Scoop". Lots of good ice cream info and recipes. 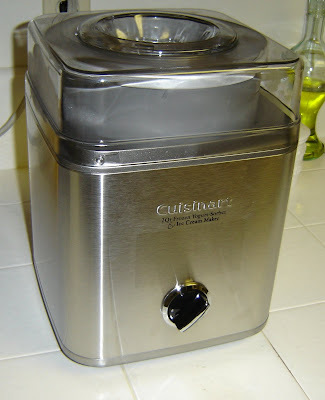 I grew up with hand-crank and always considered the product superior, but I admit to having a little Cuisinart machine that is very convenient and has led to eating a lot more ice cream. Some ice cream vendors have been caught selling drugs out of their trucks. SInce Reid gave away my secret of using buttermilk, I have resorted to a new ingredient in the batch I made last night. He will have to guess what it is!